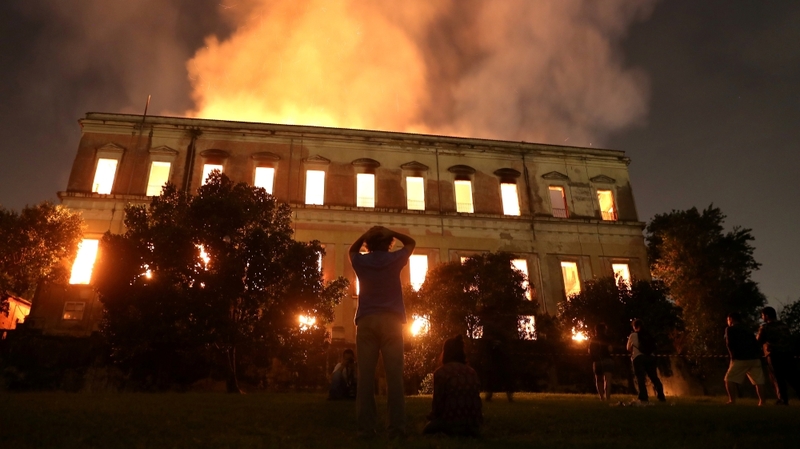 A massive fire has engulfed Brazil’s 200-year-old National Museum in the city of Rio de Janeiro, putting its valuable collection of 20 million items, including human fossils and ancient Egyptian artefacts, under threat. Firefighters and museum workers raced to save the historical relics from the blaze which broke out at 7.30pm (22:30 GMT) on Sunday. The esteemed museum in the city’s north, which houses artefacts from Egypt, Greco-Roman art and some of the first fossils found in Brazil, was closed to the public at the time of the fire. There were no reports of injuries, the museum said in a statement, and it wasn’t immediately clear how the fire began. Roberto Robadey, a spokesman for the fire department, said 80 firefighters were battling the blaze and that by midnight local time it was “just about under control” and should be out within a few hours. President Michel Temer called it “a sad day for all Brazilians”. “Two hundred years of work, research and knowledge have been lost,” Temer said in a statement. Robadey said firefighters got off to a slow start fighting the blaze because the two fire hydrants closest to the museum were not functioning. Instead, trucks had to be sent to get water from a nearby lake. But he added that some of the museum’s pieces had been spared. “We were able to remove a lot of things from inside with the help of workers of the museum,” Robadey told Globo News. The museum was founded in 1818 by King Joao VI and is considered a jewel of Brazilian culture. According to its website, the museum has a vast collection related to the history of Brazil and other countries, and many of its collections came from members of Brazil’s royal family. The museum’s deputy director, Luiz Fernando Dias Duarte, voiced “profound discouragement and immense anger” as the treasured institution burned, accusing Brazilian authorities of a “lack of attention”. He said the museum, a former palace that was once the official resident of the royal family, had never had necessary support. The National Museum, which is linked to the Federal University of Rio de Janeiro, had suffered from funding cuts. As the fire raged researchers, professors and university students expressed a mix of sorrow and indignation, with some calling for demonstrations on Monday in front of the ravaged building. Latin America’s largest nation has struggled to emerge from its worst recession in decades. The state of Rio de Janeiro has been particularly hard hit in recent years due to a combination of falling world oil prices, one of its major revenue sources, mismanagement and corruption. Previous articleRyder Cup 2018: Europe’s wildcard picks – who would you choose?